‘This will continue,’ Chief Brown says. Salt Lake City police have increased nighttime patrols in the troubled Rio Grande District following three homicides in two weeks. Courtesy SLCPD. A heightened nighttime police presence in Salt Lake City’s recently violence-plagued Rio Grande district is expected to continue at least into early next week, officials said Saturday. 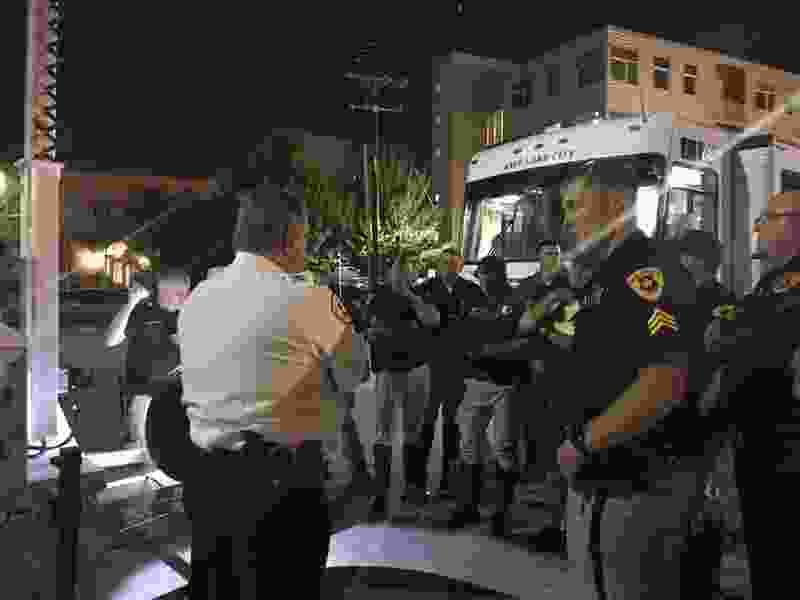 “This will continue,” Salt Lake City police Chief Mike Brown tweeted late Friday night, the first evening more officers were ordered into the district. Lt. Scott Smalley said 22 officers were assigned Friday night to the area around Pioneer Park and The Road Home shelter on Rio Grande Street. That’s up from seven who typically patrol the area at night, primarily on motorcycles. “We just wanted to have an additional presence here, and support what the bike officers are already doing,” Smalley said, adding the department hoped more officers on the street would have a “deterrent effect” for drug dealing and other illegal activity. And if violence erupts, he said, it’s nice to have more officers nearby to respond. Three people have been killed in the troubled district over the last two weeks — the most recent a Thursday night shooting at the corner of 200 South and 500 West. On Friday night, “there was nothing out of the ordinary,” Smalley said. Several people were arrested on warrants, he said, along with a handful of misdemeanor arrests. Some officers, including members of the department’s gang unit, will be reassigned from their usual evening duties elsewhere in the city, while others will work overtime, Smalley said. A larger law enforcement effort spurred by the state — which Lt. Gov Spencer Cox has called Operation Rio Grande — is expected to be unveiled in the coming days. Smalley said the current surge is considered a sort of “stopgap” measure, as the larger enforcement plan takes shape.